Pictured l to r, standing: Lawrence, Haggerty, Zalben and Solomon; seated, Principe. The long-running New York sketch comedy group Elephant Larry (previously featured here, June 6, 2006) is performing all-new shows of all-new material this year, having done a run at its home base of the People’s Improv Theater in December 2007, and just beginning another set of shows in May (9:30 p.m. Fridays, May 9 and 16), with more planned for later in the year. The five-man group Alex Zalben, Geoff Haggerty, Chris Principe, Stefan Lawrence, Jeff Solomon) draws inspiration from Monty Python and Kids In The Hall, and is prolific at making video shorts, but presents its newest sketches in a largely minimalist fashion without a lot of elaborate costumes or sets. 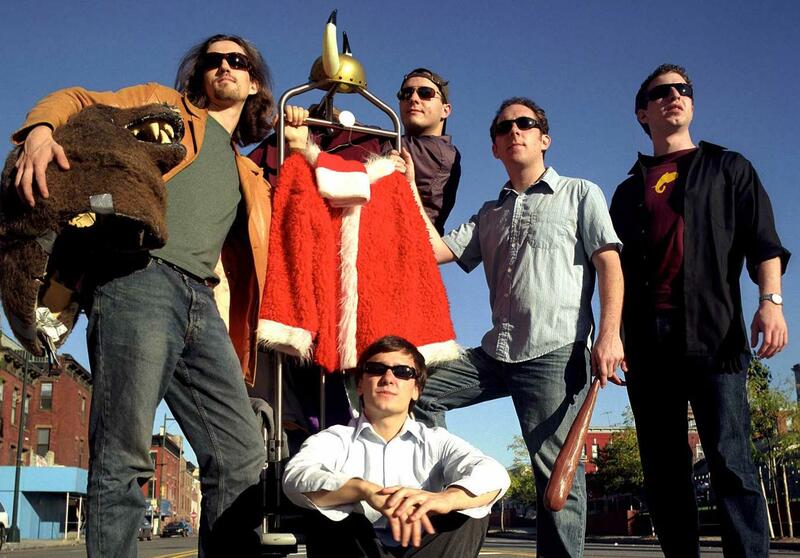 Jester spoke with Zalben about the group’s latest show, as well as his own endeavor, the Comic Book Club talk show (reviewed April 24, 2007), continuing at The PIT 8 p.m. Tuesdays in May. Jester: Tell me about the new Elephant Larry show that’s coming up. Alex Zalben: It’s all new sketches, completely live -- no video or anything like that -- and it’s all stuff that we’ve written completely for this new show. J: Any teasers you could give? AZ: Whenever you say what the plot of a sketch is, it’s never as funny, so you can’t give that out. Definitely there’s going to be some ridiculous costumes and some not-so-ridiculous costumes. Sorry that’s vague. J: Has it been awhile since the group has been active? AZ: No, we’ve been working a lot. We had the brand new show in December, and pretty much we’ve been doing video stuff non-stop when we haven’t been doing gigs here or there, or writing this new show like we’re doing now. So we meet at least two times a week if not three or four times a week, so we’re always doing stuff. J: How do you keep things fresh, having worked together as a group since 2002? AZ: The guys in the group are probably the funniest guys I’ve ever met. As long as we keep making each other laugh, that’s how it stays fresh. J: Will there be more or less pop culture references than before? AZ: We never really drew a lot of pop culture references. Most of our stuff -- timeliness is probably the wrong word -- but it comes down to what we find funny, and the stuff we find funny is usually snowmen and robots and vampires, and things like that, so there’s not a lot of skewering of pop culture that goes on. J: How has doing a lot of video changed your outlook or how you write for stage? AZ: I don’t think so. Video is video and stage is stage, and there’s sketches that belong on video that don’t belong on stage, and vice versa. So if we’re writing something, now because we’re doing a lot more video, we do a group check, asking if an idea is a video idea or a stage idea. Whatever it is, that’s what we write it for. J: What makes it go one way or another? Is it the setting or something else? AZ: Something like a commercial sketch, if we can make it on video, we just do that, unless it was specifically some sort of sketch about a product that only occurs on stage. Otherwise, I don’t see any reason, since a commercial is a filmic form, that you would do it any other way. For the most part, with some sort of TV or movie parody type sketch, why not do that on video? We do a lot less video in this show than we usually do. We’ve been moving toward, if we’re doing something on stage, just making it simple. There’s no reason to over-complicate it with costumes. That said, we write stuff like “wouldn’t it be hilarious if you were wearing this gigantic thing?” But for the most part it’s jackets, a dress, that’s it -- not necessarily at the same time. J: Are there plans to do this material for awhile? AZ: Right now we’re in a place where we’re just generating new material. This show is supposed to be fun. We’re not playing around in a genre or doing anything like that. We’re generating new material that we think is really funny to us. It’s the same thing we did with our December show and we’re looking to do at least one or two more of those before the year is out. Just do a short run -- stuff we think is really funny -- to see how it works on stage. We think it works really well on stage but the audience will tell us. There’s not necessarily a goal beyond writing some sketches and having some fun. J: On another front, how did you get the idea for Comic Book Club? AZ: Comic Book Club is something I thought about years ago. It was a just a vague idea that it would be interesting to do a comic book talk show. It was just that vague idea. I didn’t know how to put together something -- something that I knew I couldn’t put together myself. When I was working at The PIT [Zalben formerly was artistic director of the theater], I knew Justin Tyler and Pete LePage from working there separately, from sketch stuff and improv stuff. In the same week, they each came in to chat with me holding a bag from Midtown Comics -- so it was ‘are you guys comic book fans?’ They looked a little ashamed and said yes. I said, ‘It’s O.K., I’m a comic book fan too.’ So I pitched each of them on the idea of a comic book talk show -- I had just a vague idea of it -- and they were immediately on board. We met later that week to chat about what the format would be and three weeks later we did the show. J: How long has that been running? AZ: About a year and a half now, since December 2006. J: Do you have other ideas or other projects going, or with Elephant Larry and Comic Book Club, does that take up all your time? AZ: Pretty much … Justin, Pete and I now have a web version of Comic Book Club that we do, three times a week. That takes up a good chunk of time as well. There’s also day jobs. But I really like doing Elephant Larry and Comic Book Club. They’re two entirely different things so it’s fun to do both of them.